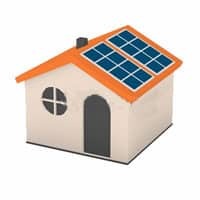 Each house has its own individual set of criteria which need to be taken into account when selecting the most cost effective solar panel system for a house or commercial premises. Once we have assessed your property and provided you with a number of options in conjunction with computer generated software simulations for these options we give you our recommendations on what we feel is the best fit for your particular circumstances. Our reputation as being one the most experienced and reputable solar thermal installation companies in Ireland has been achieved by only installing the best possible solar solutions for our customers. Roof Orientation: Ideally panels should be orientated between south east and south west (including due south). Number of occupants in the house: We always try to install the system best suited to the number of occupants in your home. We base the system size on this number as it helps us determine the size of the cylinder that should be installed in your hot press and the number of panels that should be placed on the roof. We always try and design a system that will generate between 60%and 70% of your homes annual hot water requirement. Hot water cylinder size: As part of the solar installation, your hot water cylinder is changed and replaced with a cylinder that is compatible with solar panels. These cylinders are much larger than your existing cylinder and are generally between 300lt and 500lt in size, depending on your requirements. On occasions where necessary we have had customised cylinders manufactured to suit smaller spaces, but we try and avoid this as this may add on additional costs to you the customer. Pipe insulation thickness: The pipe work which carries the heated solar thermal fluid from the panels to the cylinder must have high temperature solar rated insulation on it (made from EDPM rubber). During the repairs of systems from other installation companies we regularly find insulation that is only 7mm thick. This will lead to heat loss particularly over long distances. We use lagging with 13mm wall thickness as standard to maximise the efficiency of the system. Solar Controller: The solar controller is the ‘brains’ of the system! The better the quality of the control system the more efficient the solar panel system will run. We only use Resol controllers in conjunction with our systems and in addition to this Solar Home is one of only a few companies in Ireland who use the Resol BS4 controller as part of standard installations. This controller regulates the speed of the solar pumping system making the system more efficient in the heating process; this is particularly beneficial during the winter months when the system can work quite well at low temperatures.